Here we have the heart and soul of a multi gauge system for your performance car, this is the base pack you buy which includes the sensor control box and all the sensors, then select which gauges you want to pair with the kit from the ones listed on our site which support daisy chaining. Be it the OLED digital multi gauge display for an all in one compact display for your engine vitals, or a mix of a digital multi gauge along with some 60mm gauges, you can even run multiple digital multi gauges as well. The best part about this multi gauge base pack is that you can build your own gauge package. The system supports up to 8 screens or gauges running together, so it’s nice and flexible for you to decide which gauges you want to pair with the system. This base unit and sensor package comes with all the sensors and gear you need to get started building your multi gauge system, along with the control box they all connect back to. You have boost, EGT, oil & water temp, IAT, fuel & oil pressure sensors all included, the unit also accepts RPM, Speed, Dual Volts and Wideband inputs to make an all in one multi gauge system for your car. On the specifications tab we have listed which sensors are included, breakdown of the supported inputs, cable lengths etc. If you have any questions about the kit after reading this page, feel free to contact us anytime. Another great feature of using this base pack for your car’s gauge system is that it allows you to mix and match a range of different gauge sizes, display types via a serial daisy chain setup. For example, if you wanted to use the 10in1 digital multi gauge display, but also say a 60mm boost gauge and 60mm air fuel ratio gauge you can, you simply run the main cable from the control box to the first gauge, then each has a serial out which you run a single cable from one gauge to the next and each gauge can obtain the relevant sensor data it’s looking for from this single cable. This means you can really build up your own kits, be it just a single digital 10in1 multi gauge, dual 10in1 displays, single 10in1 with a selection of 60mm traditional stepper gauges, there is even 3.75” tacho’s that can be connected if you wish. This base pack provides all the sensors and cables, now you just need to select from the range of various daisy chain gauges to build up your desired kit. The heart of this system is the control box that all the sensors connect to. This box is a proper analog to digital control box, the analog sensors feed into it which it then converts to a digital signal. This digital signal is sent back to the gauge in serial format. This has a number of advantages over a straight analog pass-through system, one being that sensor data sent from the control box to the gauge will not be susceptible to voltage drop or interference. Another is the cable that has to run from the control box isn’t made up of 10 or more wires, it’s a much smaller cable making it easier to pass though tight spaces. The sensors that ship with this multi gauge systems are high quality but without the high price tag that comes with big brand name gauge systems. We have run them back to back with brand name gauges as reference gauges and all of them are well within acceptable accuracy variance of 1%. We understand that having sensors read correctly is hugely important, their durability and accuracy are the heart and soul of the system. But it gets to a point with sensors where you are paying extra for an additional 0.1% accuracy, in reality you only need a sensor to accurate to within 1% of the actual source, anything more than that just costs more for no real world benefit to 99% of us out there. These base units support wideband input in the form of UEGO 0-5v 10-20 AFR or 0.68 to 1.36 Lambda range, so if you are wanting to connect your wideband controller to this package and make use of the readout being on either the Multi gauge display, or the 60mm wideband daisy chain gauge you can. We also sell 14point7 Spartan 2 wideband kits which can be connected directly to this base pack. If you are already running say an innovate widedand, they have the option to configure the analog output, so you can set it to 0-5v 10-20 AFR or 0.68 to 1.36 Lambda range. An additional sensor has been added to the v2 of the base pack and control unit and this has been an IAT sensor, this stands for Air Intake Temperature sensor. These sensors will allow you to monitor the air intake temps at the manifold on turbo and supercharged cars. These sensors will read from 0c to 150c intake temps, they take the form of the IAT sensors found installed with most aftermarket ECU setups and have a 3/8” NPT thread, very similar to the GM style IAT sensors as is their resistance curves. Monitoring IAT’s can be especially important on turbo and supercharged cars, as if air intake temps get too hot while timing is advanced under boost conditions, this can lead to possible detonation. So the kits having an IAT sensor included allows you to monitor air intake temps on these vehicles. Another additional input found on the v2 models is a second dedicated volts input. So it is now possible for 4x4 owners to not only monitor their primary battery voltages, but you can now also run a line to your secondary / auxiliary battery’s and monitor the voltage on those as well. The 4x4 community has really taken to these gauges as well, and dual volts has been a feature request we have had for some time, so these latest version 2 of the control unit now have a secondary 8v to 36v input so you can monitor both primary and secondary batteries. Now for our performance customers, this feature can also come in handy and we talk more about that on the screens product page. One of the sensors that takes the most punishment and are prone to failure when using cheaper designs in the manufacturing process are the EGT sensors. We spent a great deal of time and real world testing with EGT sensors to make sure we were providing the best quality sensors possible without asking you to take out a mortgage to purchase these kits. This search lead us to these high quality insulated K-Type thermocouples included with these kits, they are made from 3030 stainless steel, can withstand constant operating temperatures of over 1000c for prolonged periods, and burst temps of up to 1200c. These new EGT sensors cost 3x that of the old sensors supplied with these kits to produce, but we are dedicated here to providing the best quality sensors possible while still maintaining a reasonable price on the kits and feel the extra cost to achieve this level of quality on the EGT sensors was justified. Another important factor which makes these new EGT sensors a cut above the rest is the majority of EGT sensors supplied with gauges are using single strand wires, these sensors are using multi strand. Now you may ask why is that better, well what we have discovered here after a year of playing around with various EGT sensors is this, heat is not the main killer of EGT sensors, vibration is. Having multiple strand wires in these sensors allows them to better cope with the harmonics and vibration of daily use, leading to less failures overall. Then we have the high quality connectors, heat shielding, these sensors really are built to take a punishment. We were not going to mess around here as we know a lot of our customers use EGT, especially the 4x4 guys, just another way we have polished the v2 models of these kits. Now while this gauge system comes with all the sensors, there are two inputs that require you to source the signals from your car, these are RPM and Speed. Now on most modern cars, their ECU will output a speed signal the system can understand, but as you start going back to cars older than 1990, the ecu’s either don’t have a speed signal you can tap into, or the signal is not understood by the control box. For most people this won’t be an issue, as speed isn’t really one of the readouts they are looking for. RPM on the other hand more people will want, as there are functions in the digital multi gauge that can make use of an RPM input, such as some of the warning setups, you have shift lights on those as well. Again this will come down to the ECU, but unlike speed, RPM can be picked up on almost all cars that ran fuel injection and have an ECU. Most ECU’s will have an RPM output on them, but if we are talking late 80’s early 90’s cars, the ECU might not have a dedicated RPM output, don’t fear as what can be done is tapping into the ECU’s ignition firing line running to the igniter, or the coil has fired return line from the igniter to the ECU. We are pretty well versed here in how to obtain RPM for these systems, so when it comes time to install we can offer assistance in how to obtain an RPM signal. The v2 kits are now all built using high quality JST style connectors throughout, while most people never think quality of connectors means anything, using high quality JST style is just another way we have really polished the product. The cables slide in smoothly, the crimping and just overall build of the connectors on the control box, 10in1 gauge, sensor cables are top notch. As above most people wouldn’t even think about this side, but we have, it’s just another way to bring up the overall quality and durability of the product. All of the temp and fluid pressure sensors in this kit are using 1/8 NPT threads, note the IAT sensor is using 3/8 NPT. 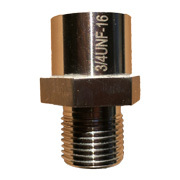 Before you install make sure to check where the sensors are going to be placed are 1/8 NPT and not 1/8 BSP. We will write an article on our blog which goes into more detail about this, including why we don’t think it’s a good idea to place oil pressure sensors into the block, rather mount them separate to the engine and run an AN line back to the sensor. If you would like more information or have questions relating to this, please feel free to contact us. We have a range of accessories that can be bought along with this kit to make installation of the sensors simpler and neater. 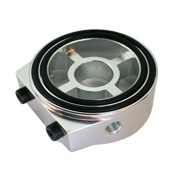 For example the oil filter sandwich plates, these allow you to place the sandwich plate between your engine block and oil filter and have three 1/8 NPT ports you can use for sensors, such as Oil Temp and Oil Pressure. Using these plates make the installation of the oil temp and oil pressure sensors much more straight forward, saves removing factory sensors, or having to tap and weld a fitting into your sump for oil temp as an example. You will also need a sandwich plate adapter bolt for them which we also sell, before ordering, check which thread type your engine block uses for its oil filter to make sure one of the four adapters we sell will fit your motor. 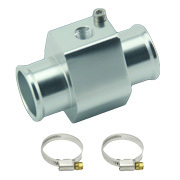 We also stock high quality stainless steel adapters, none of those cheap alloy units. Any questions in regards to these plates, feel free to contact us. Another useful accessory we sell for installation is the water temp sensor adapter hoses, these allow you to make a cut in your cars radiator hose, slip in the adapter and tighten with the supplied clamps and they have a 1/8 NPT port on top of them for your water temp sensor. Again this little product makes installing of the water temp sensor quick, simple and neat. We currently stock three different sizes that cater to a large range of different cars, just like the sandwich plate adapters, before ordering check the size of your radiator hose to make sure which you need to order for your car, any questions give us a yell.